Linear 1.0 was developed with a core team of three people: Creative, led by Jeff Hoy, Development, led by Robert Marsters and Kenny Younts as Project manager. 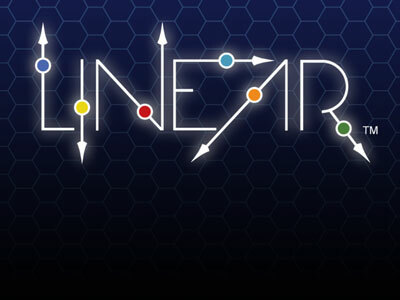 For Linear 1.0 we decided that the core game experience was what we wanted to release initially. This meant that campaign mode, multiplayer mode and things like leaderboards would be part of the first release. We used an Agile Development technique called User Stories to define the features. User stories are essentially how people will play the game. 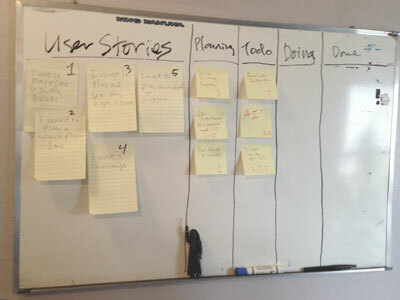 From User Stories the team would define the deliverables – the things we had to get done. Very early planning for Linear. Vader reminding us to keeping it simple! From the project requirements, the team planned the functionality and creative direction for the application. We’d coalesce the functionality into a schedule, then partition the schedule into what’s called a sprint (essentially a development cycle). Deliverables were decided before each of the sprints was started. On occasion, we would have to add in a User Story or new deliverables to the schedule, or remove User Stories out of concern for slipping the release date out beyond what we could accept. If the User Story was something we really wanted to hold onto but didn’t have the time to do, it would be moved out of the release and put into a product backlog. 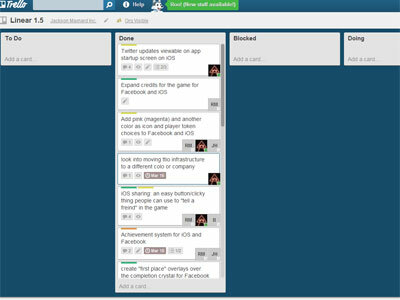 We started working on the Linear 1.0 release early April 2012. We were functionally complete mid-July 2012. Due to some scheduling conflicts, we didn’t release the game to Facebook until late August 2012. Part of the staggered release schedule of Linear was a practical consideration: Facebook Linear could be modified by us at any time, but the iPad and iPhone version could not—our game would have to be updated by Apple’s release and update mechanisms. To avoid a flurry of patches and fixes on a timeline we couldn’t control, we focused on getting Linear 1.0 really solid before we turned it over to Apple for distribution. This plan worked out well for us: We submitted Linear 1.0 to the Apple iTunes App Store in October 2012, culminating in general release of Linear to iPad and iPhone customers November 2012. Linear 1.1 and 1.5 were developed the same way. When we analyzed how people were playing the game, and who was playing the game, we wanted to add features to enhance the customer experience. Linear 1.1 was a minor release, fixing some things that customers didn’t like, and adding support for the latest generation of iPhone and iPod touch. Linear 1.5 was greatly influenced by meeting with some folks — the students of West Seattle STEM, and Betsy Aoki, a new member of the Linear team — and incorporating their ideas into the project. As before, we started with a User Story, then derived features, work items and a project plan from those ideas. Linear 1.5 built on the codebase, as well as the customer knowledge, we received from the prior Linear releases. So most of the time spent was on adding new functionality onto the game. 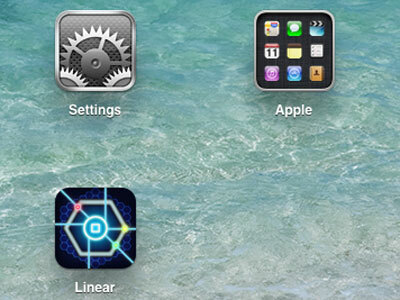 We started working on Linear 1.5 in mid-February 2013 and were done by Mid-march. 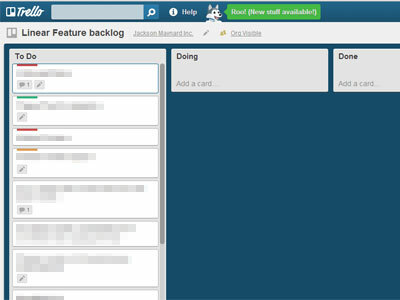 Feature Complete, according to Trello! We’re really excited by Linear 1.5. We have a better understanding of our customers, our game and our direction forward. We’re not ready yet to talk about the next release of Linear (we’re still in the planning phase), but there are some very interesting things planned! Agile Development had a very positive result in making Linear. Working together was collaborative and close-knit. Agile netted us a sharply focused plan, but without the overhead and inflexibility of micromanagement according to a plan. It gave the team members the time, the budget and the direction we all needed to accomplish our goals: making a great release.